In Brain Basics, we looked at many of the structures in the brain and how they function. In this section we will look more specifically at how they impact leadership and the workplace. 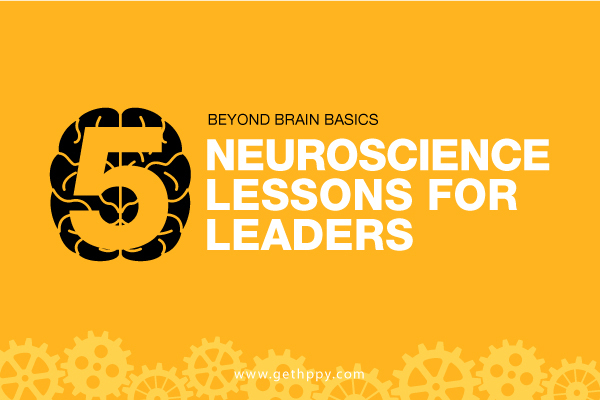 Since these are complex issues, especially for people who are just learning about neuroscience, we’ve put together 5 neuroscience lessons for leaders, that will shed some light on the practicality of these notions. At one time, it was thought that once a person reached a certain age, the brain stopped developing and could not be changed. This has since been proven untrue. It may be more difficult to change some aspects of the brain after a certain time, but the brain still has a lot of plasticity throughout a person’s lifespan. The brain continues to reform and rewire itself based on how much or how little the pathways are used. That means that we can always learn new things. The pathways are created through the connections of neurons. Each neuron has on average about 1,000 “arms” called dendrites that connect it to other neurons. The connection between the cells is called a synapse and occurs over a small gap called a synaptic cleft. The way neurons share information is through sending and receiving neurotransmitters across the small gap. The neurotransmitters trigger a chemical process, which creates an electrical charge that travels through the neuron. This process of electrical charge, neurotransmitters, electrical charge, and so on is what creates the pathway of neurons. There is a saying “Cells that fire together, wire together.” That means that when learning a new task or about a new person, the best way to learn it is to do it multiple times, so that the neurons “fire together” and eventually “wire together”. It is never too late for a leader or an employee to learn a new skill or a new way of doing things. Change is hard sometimes, but research tells us it is possible. Emotions are an important aspect of how the brain changes and how we learn. Positive feelings activated through the reward system of the brain enhance the pathways and improve learning. The reward system is very complex and has pathways in many areas of the brain, but often it is regulated by the neurotransmitter dopamine. These pathways and the positive feelings associated with them have been studied using illegal drugs that increase dopamine. In other studies, researchers have found that dopamine also has a role in attention and motivation. There are two main reward systems in the brain that are related to attention and motivation: primary and secondary. Primary rewards are related to primary needs like food, water, and shelter. We feel good when we have those needs met. Secondary rewards help our survival but are not vital to it. They include things like information, power, trust, touch, appreciation, and community. For leaders, rewards are often an effective way to motivate employees. Based on neuroscience, there are some rewards that seem to release more dopamine than others. You will see that money, or material goods, are not on the list. Many of the rewards are related to social interaction in some way. Following the science, leaders can review their system of motivation and rewards to consider ideas that are proven to be rewarding to the brain. While each employee is different, there are many categories or rewards that would be useful to implement in order to truly activate an employee’s reward pathway. More dopamine means employees who are happier, more focused, and more motivated. In the early 1990s scientists discovered mirror neurons. They found that when one person watches another do some kind of action, the neurons of the first person fire as if they were actually doing it. There is a common example that has to do with yawning. Research has shown that yawning can be contagious. Why? Mirror neurons. When one person yawns and another observes, the neuronal pathways for yawning in the observer’s brain are activated, causing them to yawn too. While this may explain why a yawn can seem to travel around an office, mirror neurons are really important for learning, emotional awareness, and empathy. When we watch someone do something, our brain is actually learning how to do it. When we see someone experiencing an emotion, our brain processes that emotion as well, increasing empathy. Mirror neurons can be important aspects of leadership as we can see how our emotional and physical states as leaders are actually teaching our employees how to act and how to respond emotionally to us. When mirroring is connected to a certain need and when it is understood from a familiar viewpoint, the effect is stronger. Mirror neurons, again, prove how much humans are social animals. People are highly connected to the people and the environments around them. Because of this connection, leaders can create environments where people can mirror others who create collaborative and cooperative learning and working atmospheres. Individuals are important to the team and the team is important to the individuals through the power or mirror neurons. Many people want to believe that they can make decisions based exclusively on free will and their rational minds. That is not often backed by science, as research has shown that there are many unconscious processes that influence and dictate why we behave in the ways we do. Those processes follow brain pathways that were put into place when we were very young. In most cases we have already made a decision before we have actually thought about it. This happens in the limbic system. Our cerebral cortex then has to rationalize the decision through language and planning, leading to, what some may call, the illusion of free will. That is not to say that the cerebral cortex cannot influence the limbic system. This can be seen in people who practice meditation and mindfulness. As a leader, it is particularly useful to know that when we are faced with stress or a threat, the executive functions of the brain shut down, leaving the unconscious processes of the limbic system in charge of decision making. These parts of the brain react on emotion and survival instincts. Leaders also need to be aware that in terms of learning and team building, change happens not from the cerebral context but from the limbic system. With effective company rewards and interventions, the slow process of changing the limbic system can start to take place. The information presented is a starting point for creating a work environment that is based around what is healthy for the brain. Leaders who ignore how the brain functions are leaving a lot to chance. Sometimes things might be great, but then something can happen and they might worsen. Having a brain-based work environment can help leaders effectively navigate the rises and falls in the economic climate. Be a brain-based leader by helping the people improve the work environment, and the environment improve the people. Both influence the other and, in a working system, there will be an upward spiral of motivation, growth, and productivity. Overtime, this environment will actually change the brains of the people in it, making the team and the organization better able to adapt to change.